A virtual observatory for the unprecedented study and monitoring of life in an integrative way is under construction by some 400 biology and technology experts from 50 countries. 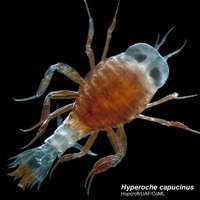 Sand-fleas such as Hyperoche capucinus, are common predators swimming in polar waters. This specimen, about the width of a finger, was photographed during the CEAMARC 2008 expedition aboard the Umitaka Maru to the Antarctic, part of a joint CAML/ArcOD/CMarZ effort. Credit: Russ Hopcroft, University of Alaska Fairbanks, Census of Marine Life. A virtual observatory for the unprecedented study and monitoring of life in an integrative way is under construction by some 400 biology and technology experts from 50 countries, who are meeting in London June 1 to 3, 2009. Biodiversity information and innovative internet architecture are being used to create a seamless, global view of life. With the benefit of a high-tech field guide for 21st Century, public observations will help map world biodiversity, monitor climate change, and conserve species. Biodiversity information and innovative internet architecture are being used to create a seamless, global view of life. With the benefit of a high-tech field guide for 21st Century, public observations will help map world biodiversity, monitor climate change, and conserve species. 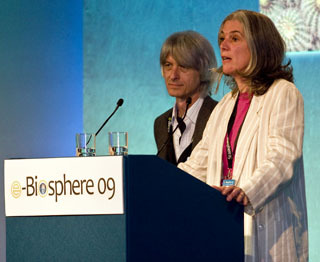 Hosted by the Natural History Museum, London, and co-sponsored by the Encyclopedia of Life (EOL), based at the Smithsonian Institution, and 12 other leading biodiversity research institutions, 400 experts from 50 nations participating at the first e-Biosphere 09 International Conference on Biodiversity Informatics held at the at the Queen Elizabeth II Conference Centre. They are applying the latest in information technologies to build new software tools that make a global, free access biodiversity information network a reality. Participants will accelerate their fusion into a powerful information apparatus of historic promise for biodiversity mapping, climate change monitoring and species conservation, among many other benefits. Within 10 years, scientists say, they could have an efficient and effective way of tracking changes over time in the range and abundance of plants and animals as worldwide temperature and precipitation patterns shift. The online information system for life on Earth, now under construction, will take its place alongside the global network that records earthquakes, or the world meteorology data network that pools information to predict the weather. "We are creating a virtual observatory for world biodiversity, where environmental observations, specimen data, experimental results, and sophisticated modeling can be done across all levels of biodiversity -- from genes to ecosystems," says organizer James Edwards, Executive Director of the Encyclopedia of Life, Washington DC. "Information about the biology and distribution of Earth's species is enormously important to science and our quality of life. And the impact of that information increases tremendously when it is connected and made easily accessible online to all." The integrated global knowledge base being created will also function as a high-tech "field guide" for the 21st Century, Dr. Edwards explains, allowing citizen users to click seamlessly from images of a plant or animal specimen, to information about its species and genetic code, to maps of its range and more. Interested in the forest on your favorite mountain trail? You'll soon be able to start with an online satellite image, then click to obtain the wanted information - from the forests' tree species, the shapes of each tree's leaves and the color of its flowers, the insects that feed on the flower, to the DNA of microbes that live in the insects. comprehensive virtual observatory of historic importance. Or start small and move up. Found a strange insect in your garden? Online identification guides, digital images and maps, and global databases will help puzzle out the species name, where it came from and whether it's a harmful invasive species. Then join tens of thousands of users who report their observations and build the global database - an army of citizen scientists who help reveal and verify planetary changes such as the density and area of forest cover or the time plants flower locally. What may sound like a Star Trek fantasy in fact is a high-tech tool within reach, with many components already in place. Aviation, through the identification of birds struck by aircraft, and the timing, altitude and routes of their migrations. Expert groups are working on key aspects of this massive undertaking, from images of species (ARKive), to maps of the marine environment (Aquamaps), to genes (DNA barcoding of species), to display portals, to name but a few. The conference in London represents a landmark step towards the integration of these elements to achieve a dynamic new scientific capability. 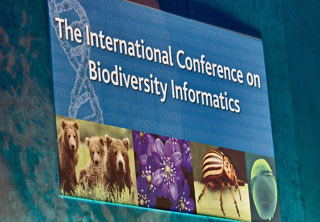 Biological informatics, and its subset biodiversity informatics, grew out of a union between biologists and "informaticians" - the branch of computer science that deals with managing data and making it available to users. Thanks to biodiversity informatics, scientists can create a "virtual observatory" to describe, analyze and model world biodiversity at scales that transcend simple landscape. Biomes, ecosystems, phyla, flora, fauna, hotspots, rarities, genetic erosion, and the impact of alien species - none of these can actually be physically "observed"; understanding requires the synthesis of information from extensive primary data. Projects integrating data on the distributions of plants and animals with information on environmental factors like temperature, rainfall, and soil types. These integrated systems allow researchers to monitor changes in species distributions and to study the effects of climate change and other human impacts. Moving beyond analysis to global biodiversity modelling, past, present and future. The Encyclopedia of Life, aggregating data from diverse sources to create an online page for every known species - 1.8 million in all. The Biodiversity Heritage Library, one of EOL's subprojects, is digitizing millions of pages of published research that will enrich the content of the species pages. In order to demonstrate powerful possibilities already in place, teams of scientists will compete during the conference in a unique race to show how rapidly new information in biology can be distributed through and connected to the existing web of biodiversity information. For example, teams may attempt to complete within three days the entire process involved in the formal identification of new species - from its discovery to peer-reviewed description - a process that has typically involved at least months, often years. The progress of the challengers can be followed by anyone online at www.e-biosphere09.org/page/31/the-e-biosphere-09-informatics-challenge. Promote the use of sites and functions showcased at e-Biosphere 09 for the production of national assessments required by the International Convention on Biodiversity. Says David Schindel of the Consortium for the Barcode of Life (CBOL), also based at the Smithsonian Institution: "In addition to showcasing emerging technologies like DNA barcoding and their potential benefits to science and society, this conference will help identify gaps in our knowledge of the living world, fill those gaps, and be sure that the connections among information sources are working smoothly. This means making sure that the people who collect data and put it on the web are using the same protocols, so the data are really consistent and comparable. For example, there are a lot of ways of measuring your position on Earth and reporting that on the web." Prof. Norman MacLeod, The Natural History Museum's Keeper of Palaeontology, comments: "The democratization of biodiversity information is a development of profound importance being accomplished through integrated, easy-to-use tools that allow anyone in the world to extract, manipulate, interact with and contribute information about the plants, animals, microbes, fungi, and other organisms with which we share this planet. "Tools under development to achieve this goal range from fiendishly complex mathematics of automated species recognition software to teaching aids that will allow schoolchildren to access and analyse primary scientific data for class reports." "Forty years ago astronauts took pictures of Earth from the Moon. e-Biosphere 09 is creating a 'macroscope' that will allow billions of people to zoom from the moon to Madagascar to a monkey and its DNA," says Jesse Ausubel, a Program Director of the Alfred P. Sloan Foundation, New York.